Definition at line 47 of file soapH.h. Referenced by soap_getelement(), soap_in_byte(), soap_out_byte(), soap_put_byte(), and soap_putelement(). Definition at line 56 of file soapH.h. Referenced by soap_getelement(), soap_in_int(), soap_out_int(), soap_put_int(), and soap_putelement(). Definition at line 891 of file soapH.h. Referenced by soap_getelement(), soap_markelement(), soap_put_PointerToArrayOf_USCORExsd_USCOREstring(), and soap_putelement(). Definition at line 880 of file soapH.h. Definition at line 867 of file soapH.h. Definition at line 854 of file soapH.h. Definition at line 900 of file soapH.h. Referenced by soap_getelement(), soap_markelement(), soap_put_PointerTostd__string(), and soap_putelement(). Definition at line 65 of file soapH.h. 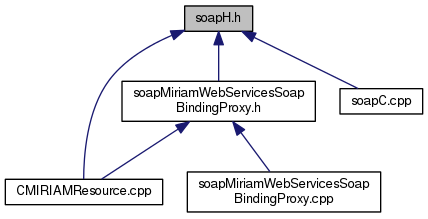 Referenced by soap_fdelete(), soap_getelement(), soap_in_PointerTostd__string(), soap_in_std__string(), soap_instantiate(), soap_instantiate_std__string(), soap_markelement(), soap_out_PointerTostd__string(), soap_out_std__string(), soap_put_std__string(), soap_putelement(), ArrayOf_USCORExsd_USCOREstring::soap_serialize(), soap_serialize_ns2__checkRegExp(), soap_serialize_ns2__checkRegExpResponse(), soap_serialize_ns2__getDataResources(), soap_serialize_ns2__getDataTypeDef(), soap_serialize_ns2__getDataTypeDefResponse(), soap_serialize_ns2__getDataTypePattern(), soap_serialize_ns2__getDataTypePatternResponse(), soap_serialize_ns2__getDataTypeSynonyms(), soap_serialize_ns2__getDataTypeURI(), soap_serialize_ns2__getDataTypeURIResponse(), soap_serialize_ns2__getDataTypeURIs(), soap_serialize_ns2__getJavaLibraryVersionResponse(), soap_serialize_ns2__getLocation(), soap_serialize_ns2__getLocationResponse(), soap_serialize_ns2__getLocations(), soap_serialize_ns2__getLocations_(), soap_serialize_ns2__getMiriamURI(), soap_serialize_ns2__getMiriamURIResponse(), soap_serialize_ns2__getName(), soap_serialize_ns2__getNameResponse(), soap_serialize_ns2__getNames(), soap_serialize_ns2__getOfficialDataTypeURI(), soap_serialize_ns2__getOfficialDataTypeURIResponse(), soap_serialize_ns2__getResourceInfo(), soap_serialize_ns2__getResourceInfoResponse(), soap_serialize_ns2__getResourceInstitution(), soap_serialize_ns2__getResourceInstitutionResponse(), soap_serialize_ns2__getResourceLocation(), soap_serialize_ns2__getResourceLocationResponse(), soap_serialize_ns2__getServicesInfoResponse(), soap_serialize_ns2__getServicesVersionResponse(), soap_serialize_ns2__getURI(), soap_serialize_ns2__getURIResponse(), soap_serialize_ns2__isDeprecated(), soap_serialize_ns2__isDeprecatedResponse(), and soap_serialize_PointerTostd__string(). Definition at line 919 of file soapH.h. Referenced by soap_getelement(), soap_in_string(), soap_markelement(), soap_out_string(), soap_put_string(), soap_putelement(), and soap_serialize_string(). Definition at line 1173 of file soapC.cpp. References soap_clist::ptr, soap_clist::size, SOAP_ERR, SOAP_OK, SOAP_TYPE_ArrayOf_USCORExsd_USCOREstring, SOAP_TYPE_ns2__checkRegExp, SOAP_TYPE_ns2__checkRegExpResponse, SOAP_TYPE_ns2__getDataResources, SOAP_TYPE_ns2__getDataResourcesResponse, SOAP_TYPE_ns2__getDataTypeDef, SOAP_TYPE_ns2__getDataTypeDefResponse, SOAP_TYPE_ns2__getDataTypePattern, SOAP_TYPE_ns2__getDataTypePatternResponse, SOAP_TYPE_ns2__getDataTypesId, SOAP_TYPE_ns2__getDataTypesIdResponse, SOAP_TYPE_ns2__getDataTypesName, SOAP_TYPE_ns2__getDataTypesNameResponse, SOAP_TYPE_ns2__getDataTypeSynonyms, SOAP_TYPE_ns2__getDataTypeSynonymsResponse, SOAP_TYPE_ns2__getDataTypeURI, SOAP_TYPE_ns2__getDataTypeURIResponse, SOAP_TYPE_ns2__getDataTypeURIs, SOAP_TYPE_ns2__getDataTypeURIsResponse, SOAP_TYPE_ns2__getJavaLibraryVersion, SOAP_TYPE_ns2__getJavaLibraryVersionResponse, SOAP_TYPE_ns2__getLocation, SOAP_TYPE_ns2__getLocationResponse, SOAP_TYPE_ns2__getLocations, SOAP_TYPE_ns2__getLocations_, SOAP_TYPE_ns2__getLocationsResponse, SOAP_TYPE_ns2__getLocationsResponse_, SOAP_TYPE_ns2__getMiriamURI, SOAP_TYPE_ns2__getMiriamURIResponse, SOAP_TYPE_ns2__getName, SOAP_TYPE_ns2__getNameResponse, SOAP_TYPE_ns2__getNames, SOAP_TYPE_ns2__getNamesResponse, SOAP_TYPE_ns2__getOfficialDataTypeURI, SOAP_TYPE_ns2__getOfficialDataTypeURIResponse, SOAP_TYPE_ns2__getResourceInfo, SOAP_TYPE_ns2__getResourceInfoResponse, SOAP_TYPE_ns2__getResourceInstitution, SOAP_TYPE_ns2__getResourceInstitutionResponse, SOAP_TYPE_ns2__getResourceLocation, SOAP_TYPE_ns2__getResourceLocationResponse, SOAP_TYPE_ns2__getServicesInfo, SOAP_TYPE_ns2__getServicesInfoResponse, SOAP_TYPE_ns2__getServicesVersion, SOAP_TYPE_ns2__getServicesVersionResponse, SOAP_TYPE_ns2__getURI, SOAP_TYPE_ns2__getURIResponse, SOAP_TYPE_ns2__isDeprecated, SOAP_TYPE_ns2__isDeprecatedResponse, SOAP_TYPE_SOAP_ENV__Code, SOAP_TYPE_SOAP_ENV__Detail, SOAP_TYPE_SOAP_ENV__Fault, SOAP_TYPE_SOAP_ENV__Header, SOAP_TYPE_SOAP_ENV__Reason, SOAP_TYPE_std__string, and soap_clist::type. Referenced by soap_instantiate_ArrayOf_USCORExsd_USCOREstring(), soap_instantiate_ns2__checkRegExp(), soap_instantiate_ns2__checkRegExpResponse(), soap_instantiate_ns2__getDataResources(), soap_instantiate_ns2__getDataResourcesResponse(), soap_instantiate_ns2__getDataTypeDef(), soap_instantiate_ns2__getDataTypeDefResponse(), soap_instantiate_ns2__getDataTypePattern(), soap_instantiate_ns2__getDataTypePatternResponse(), soap_instantiate_ns2__getDataTypesId(), soap_instantiate_ns2__getDataTypesIdResponse(), soap_instantiate_ns2__getDataTypesName(), soap_instantiate_ns2__getDataTypesNameResponse(), soap_instantiate_ns2__getDataTypeSynonyms(), soap_instantiate_ns2__getDataTypeSynonymsResponse(), soap_instantiate_ns2__getDataTypeURI(), soap_instantiate_ns2__getDataTypeURIResponse(), soap_instantiate_ns2__getDataTypeURIs(), soap_instantiate_ns2__getDataTypeURIsResponse(), soap_instantiate_ns2__getJavaLibraryVersion(), soap_instantiate_ns2__getJavaLibraryVersionResponse(), soap_instantiate_ns2__getLocation(), soap_instantiate_ns2__getLocationResponse(), soap_instantiate_ns2__getLocations(), soap_instantiate_ns2__getLocations_(), soap_instantiate_ns2__getLocationsResponse(), soap_instantiate_ns2__getLocationsResponse_(), soap_instantiate_ns2__getMiriamURI(), soap_instantiate_ns2__getMiriamURIResponse(), soap_instantiate_ns2__getName(), soap_instantiate_ns2__getNameResponse(), soap_instantiate_ns2__getNames(), soap_instantiate_ns2__getNamesResponse(), soap_instantiate_ns2__getOfficialDataTypeURI(), soap_instantiate_ns2__getOfficialDataTypeURIResponse(), soap_instantiate_ns2__getResourceInfo(), soap_instantiate_ns2__getResourceInfoResponse(), soap_instantiate_ns2__getResourceInstitution(), soap_instantiate_ns2__getResourceInstitutionResponse(), soap_instantiate_ns2__getResourceLocation(), soap_instantiate_ns2__getResourceLocationResponse(), soap_instantiate_ns2__getServicesInfo(), soap_instantiate_ns2__getServicesInfoResponse(), soap_instantiate_ns2__getServicesVersion(), soap_instantiate_ns2__getServicesVersionResponse(), soap_instantiate_ns2__getURI(), soap_instantiate_ns2__getURIResponse(), soap_instantiate_ns2__isDeprecated(), soap_instantiate_ns2__isDeprecatedResponse(), soap_instantiate_SOAP_ENV__Code(), soap_instantiate_SOAP_ENV__Detail(), soap_instantiate_SOAP_ENV__Fault(), soap_instantiate_SOAP_ENV__Header(), soap_instantiate_SOAP_ENV__Reason(), and soap_instantiate_std__string().